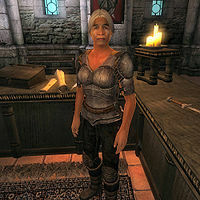 Rohssan is a Redguard smith and the proprietor of A Fighting Chance in the Market District of the Imperial City. She sells blade and blunt weapons, including the unique Battleaxe of Hatred. She also offers advanced training in Armorer and repair services. She owns a dog that keeps a close guard on the second floor of the house, where Rohssan's Antique Cutlass is stored. Acquiring this cutlass undetected and without bloodshed will be your second and final chance in the Thieves Guild initiation quest. Running one of the most famous weaponry stores in Cyrodiil is hard work and Rohssan spends a huge part of her life dedicated to her duties. As is common with Market District merchants, she sleeps in the private quarters above the shop every night between midnight and 6am. After waking up, she sits down at the dinner table and eats a two-hour breakfast and spends a bit of time with her dog. At 8am, she goes downstairs and unlocks the door for customers. The next twelve hours is spent behind the counter in the main trading room, where she offers her various services. At 8pm, she finally locks up and leaves the shop. On all weekdays except Sundas, she will spend the evening wandering around the Market District. On Sundas, at 8pm, she will join the majority of her fellow merchants and go to the Temple of the One for an evening prayer. She always heads back to A Fighting Chance and finds her bed at midnight. She wields a steel shortsword and wears an iron cuirass with leather boots and greaves. At nighttime, she changes into a more comfortable blue & green outfit, which she also wears on her weekly trip to the Temple. She carries around the ultra rare short britches, her shop key and a small amount of gold. Rohssan's superior armorer skills have not gone unnoticed among the citizens of the Imperial City. When asked about rumors, they will tell you that "Rohssan is a talented smith. One of the best around, if you ask me." and "If you go to the Fighting Chance, make sure to speak with Rohssan about repairing armor." The first time you enter her store and approach her, she will give you a warm welcome: "Welcome to 'A Fighting Chance'. I'm Rohssan, proprietor. I sell the best swords in the City, and I offer Advanced Training for Armorers." As an advanced trainer, Rohssan can provide you with the necessary reference for the Armorer Master Training quest. Once your armorer skill level reaches 70, speak to her, and choose the "training" option, which will trigger the quest and a confession: "Much as I hate to admit it, Gin-Wulm knows more about smithing than I do. Says it's in his blood. You want to be the best? Then you'd better head over to The Best Defense and talk to him. Getting him to train you will be no small feat, though."